Pear Promo have worked closely with Equinox and Cadw at a number of their events! 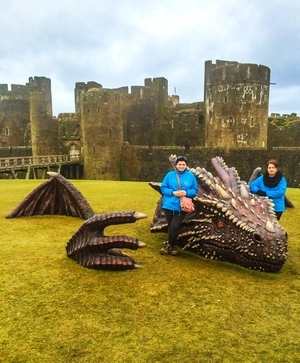 We provided staff to take care of Cadw's smoke breathing Dragon at Caerphilly Castle and their courageous Mike the Knight in a number of castles including Raglan Castle, Harlech Castle and Caernarfon Castle! We have also worked closely Principality Stadium on a number of their events, including working with members of the Welsh Rugby team at the Principality Stadium in Cardiff! Within the 'Fan Zone'. We also helped them to promote the world wide show 'Monster Jam' and their famous Judgement Day!